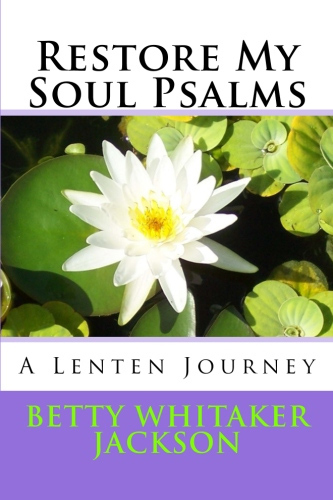 Restore My Soul Psalms: A Lenten Journey is a book of original psalm poems, most of which were written during Lent 2018. This was a deliberate time of prayer, reflection, and Bible study leading to remarkable refreshment. Several events in the news initiated writing these poems. On February 14th, usually a day of showing love to partners and others, a seventeen-fatality school shooting event occurred near our home in Palm Bay, Florida. That of course was tragic, as was the Orlando shooting previously. Secondly, I was reading once again passages from Revelation. I am currently writing a major study on the use of water in the Bible, writing psalms, essays, and discussion questions. I once more read John’s words from Christ about churches that were lacking in passion and had lost their focus. The term “lukewarm” is used. I reflected upon my own Christian walk. This led to a renewed examination of my motives, my studies, my application of Biblical principles, and my prayer life. I posted each day’s My Psalm on my two Facebook accounts and my website, and received comments from people in various parts of the world as a result. I chose the white waterlily picture as a metaphor. The purity of the lily is self-evident. It is how I long to be. It is surrounded by less than perfect water cabbage leaves, and the rippling water shows outside influences which affect our pure motives. We can never be totally pure, although Scripture tells us Christ’s blood washes us white as snow, and that God’s forgiveness is so great our iniquities are removed as far as the East is from the West. To God’s Glory. Several themes emerged as I pursued this journey. God’s sovereignty, His immense patience with us, His creative prowess, His moment by moment direction over the smallest details of my life, His overreaching mercy, His promises, His faithfulness, and His love for us, His children.